The finds hut on the Ness is a small, wooden hut, containing finds supervisor Anne, her assistants Scott and Sam (whom we will hear from in a future diary) and an ever-increasing array of stunning finds. The quern from Structure Fourteen is studied, while being recorded by National Geographic’s photographer, Jim Richardson. Today was a bad day for the finds folk in that sense — although a brilliant one for everyone else. The biggest hut-filler came from Structure Fourteen, where a very large quern/grinding stone was taken from the west wall in which it had been incorporated. It is a lovely piece of stone, with the oval grinding area clearly defined and taking several strong diggers to lift. Immediately, Scott set to work with his XRF machine to see if he could identify what material had been ground on it – watch this space as the anaysis of the results is not immediate. More stone came from Structure Eight in the form of a stone spatula, somewhat similar to the ones found at the north end of the structure, but not so finely made. Ken cradles the polished stone ‘spatula’ from Structure Eight. Professor Mark Edmonds emerged from Structure Ten with a stone ball, which may be a rough-out for the type of carefully carved stone balls sometimes found at other Neolithic sites, such as Skara Brae. 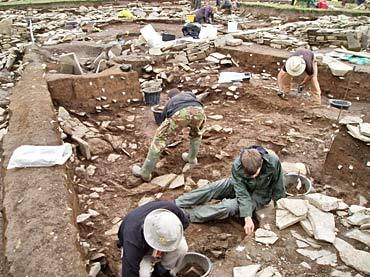 Site director Nick has been promising a bottle of whisky for the first person to find a stone ball, but somehow the requirements keep shifting. A rough-out does not qualify, he says. Some of us felt that the whalebone macehead from Structure Eight should certainly have qualified, if in a different category, but there is a general feeling abroad that the bottle of whisky will remain as elusive as the perfect stone ball seems to be. A polished-stone chisel also came from Structure Fourteen today and the task of removing the rubble and clay from the undamaged areas of the northern part of the building is going ahead quickly. Meanwhile, more nice Grooved Ware pottery came from the central midden area, courtesy of Libby. At the southern end of Structure Eight, Dave is having a tough time disentangling the many dumps of rubble and midden. The nice sequence seen at the northern end of the building is not replicated at the other end and, coincidentally, the other Dave, in Structure Twelve, is having exactly the same problem as he grapples with the removal of material from the southern end of his building. Libby reveals another fantastic spread of large, decorated Grooved Ware. Jan and Claire are continuing to follow the robber cut in the north wall of Structure Ten, which should lead to a clear definition of the north-east corner of the building in its original phase. Trish’s work in the passage between Structure One and Structure Nineteen (the building under Structure Seven) is beginning to hint that Nineteen’s walls may have gone through several phases of alteration. Today, we welcomed, once more, Roff Smith of National Geographic magazine and his family. Roff is producing a lavishly illustrated article on the Ness for the magazine for possible publication next year. As the worldwide scope of National Geographic is over 40 million people, this is great news for the Ness, but also for the reputation and international profile of Orkney. Dave and his crew unravel the midden and rubble infill of the south end of Structure Eight. Hello! My name is Jo Heupel and I am a student at Willamette University. 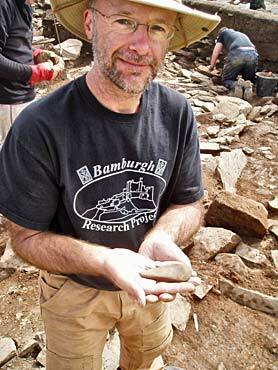 I have been on the Ness of Brodgar site with the Willamette group for almost three weeks. Over this time, I have been taught how to excavate, how to survey, how to plan and draw sections, and how to do most other activities necessary on site. Today, I started my day out by doing some leveling. This is where we use a premeasured spot on site to determine where sea level is and do some basic maths to see how far down we have excavated in locations throughout a structure. Later in the day, I did some planning of Structures Thirteen and Fourteen. 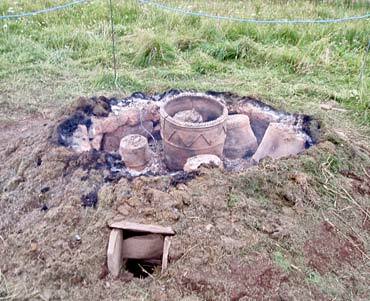 Planning is used to help archaeologists understand the site and structures better. This specific plan’s purpose was to record the locations of at least two revetting walls so they could be removed to see what is underneath. The results of the kiln, fired yesterday. Next to me a grinding stone was removed shortly after lunch. 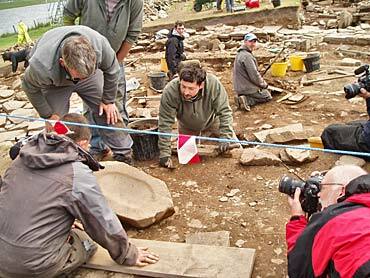 The stone was about 30 centimetres in depth, in some spots, and took quite a few people to remove. It was an exciting removal for many of the archaeologists on site because they have been able to see the top of it for a long time, but hadn’t been able to remove it. Overall, the Ness of Brodgar is an incredible site. There is so much to be uncovered and so much left to learn. I really value my time working on site with my fellow students and archaeologists from all over the world. Every day is an exciting new day with new finds, new ideas, and new people. I am forever grateful of the opportunity to be working and learning on site and suggest that anyone considering visiting the Ness of Brodgar should do so immediately. 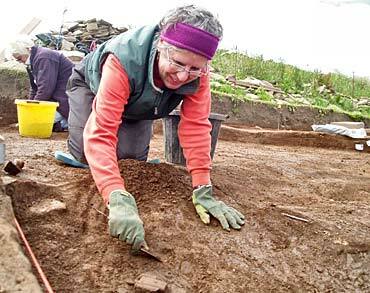 The archaeology and history of Orkney is a long and interesting one, filled with beauty.